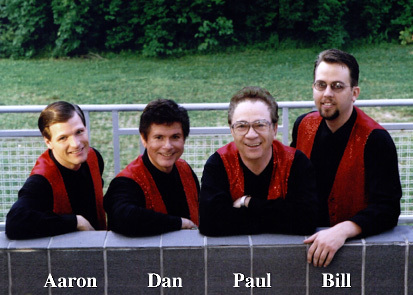 Back in 1985, Paul Ogle, bass, and Dan Monahan, baritone, decided to start the Rivertown Sound Quartet – inspired by the great vareity of music from our hometown, St. Louis, Missouri. Later they were joined by Aaron Hardin, lead, and Bill Dean, tenor. As faithful members of the Barbershop Harmony Society (formerly known as SPEBSQSA), they were dedicated to preserving good singing and four part harmony. However, while they continue to sing traditional songs from the “turn of the century”, more and more audiences have asked them to sing gospel songs as well as hits from the 1950’s. As a result they have become St. Louis’ premiere Doo Wop quartet and are very pleased to hold that position. They usually sing without a band – just four voices making the music. When they do sing with a band, it is the great Mid South Revival Band and Steve Davis. For more than a decade, the Rivertown Sound Quartet has been delighted to be part of the “Memories of Elvis” family. During the many rehearsals and performances they have become good friends with the extremely talented band members, the wonderful fan club, and, of course, Steve Davis himself. Steve doesn’t just sing songs, he recreates the feeling of an era that is long gone – except when “Memories of Elvis” explodes on stage. The Rivertown Sound is honored to be part of it!